Fred Perry Sale is now on across all mens clothing! One for the cool cats, Fred Perry has long been celebrated as putting the chic into sportswear. Since the brand's birth in the 1940s when Austrian footballer Tibby Wegner and tennis champ Fred Perry got their heads together, the unique British style of Fred Perry fashion has led the way in male and female sporty street wear, and has been supported by various different subcultures such as the Mods, skinheads and soul boys. Choose Fred Perry if you want to look innovative and on the button. Pick up a classic Fred Perry shirt or Harrington Jacket, or check out collections by cycling champ Bradley Wiggins and fashion designer Bella Freud. Add Fred Perry to your Favourites list and be the first to know every time they have a Sale on! 1st January 2018 - Fred Perry New Years Day sales for 2018. 7th May 2018 - Fred Perry Early May Bank Holiday sales for 2018, add to your diary now! July 2018 - Fred Perry Summer 2018 sales, joining us? 23rd November 2018 - Fred Perry Black Friday sales in 2018 start on Friday 24th November. 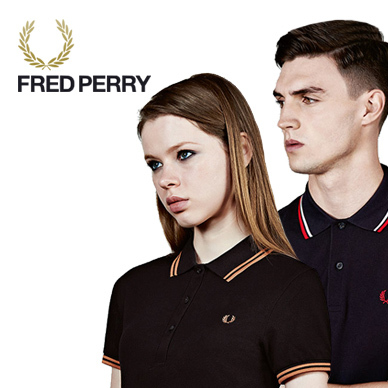 Add products from Fred Perry to your Love Sales list. Get the Love Sales button now! Fred Perry January Sale is now on across all mens clothing! Fred Perry Boxing day sale is now on across all mens clothing! Fred Perry January 50% off sale across everything men and womens! The Fred Perry January Sale is on with up to 50% off a fantastic range of clothing, footwear and accessories for men, women and children. Buy now and do not miss out! The Fred Perry Boxing Day Sale is on with up to 50% off a fantastic range of clothing, footwear and accessories for men, women and children. Buy now and do not miss out!